Effective encoding of residue contact information is crucial for protein structure prediction since it has a unique role to capture long-range residue interactions compared to other commonly used scoring terms. The residue contact information can be incorporated in structure prediction in several different ways: It can be incorporated as statistical potentials or it can be also used as constraints in ab initio structure prediction. To seek the most effective definition of residue contacts for template-based protein structure prediction, we evaluated 45 different contact definitions, varying bases of contacts and distance cutoffs, in terms of their ability to identify proteins of the same fold. We found that overall the residue contact pattern can distinguish protein folds best when contacts are defined for residue pairs whose Cβ atoms are at 7.0 Å or closer to each other. Lower fold recognition accuracy was observed when inaccurate threading alignments were used to identify common residue contacts between protein pairs. In the case of threading, alignment accuracy strongly influences the fraction of common contacts identified among proteins of the same fold, which eventually affects the fold recognition accuracy. The largest deterioration of the fold recognition was observed for β-class proteins when the threading methods were used because the average alignment accuracy was worst for this fold class. When results of fold recognition were examined for individual proteins, we found that the effective contact definition depends on the fold of the proteins. A larger distance cutoff is often advantageous for capturing spatial arrangement of the secondary structures which are not physically in contact. For capturing contacts between neighboring β strands, considering the distance between Cα atoms is better than the Cβ−based distance because the side-chain of interacting residues on β strands sometimes point to opposite directions. Residue contacts defined by Cβ−Cβ distance of 7.0 Å work best overall among tested to identify proteins of the same fold. We also found that effective contact definitions differ from fold to fold, suggesting that using different residue contact definition specific for each template will lead to improvement of the performance of threading. The tertiary structure of proteins provides crucial information for understanding molecular mechanisms of biological functions. Protein structures also serve as a platform for various branches of biotechnology, including drug design[1, 2] and protein engineering[3–5]. Although protein structures have been solved by experiments at an increasing rate, a flood of new sequences have been determined even more rapidly due to the advance of sequencing technologies[6, 7]. Taking advantage of the enlarging database of experimentally solved protein structures, it is expected that computational structure prediction methods, especially template-based methods, will play a more significant role in providing structure of newly sequenced proteins[9–12]. However, computing accurate structure models is still not always possible especially when template structures available do not share significant sequence similarity to a target sequence. Template-based structure prediction methods usually employ structure-based scoring terms together with sequence matching terms to enhance structure recognition and alignment accuracy[14–18]. Structure-based terms used include secondary structure prediction, main-chain angle propensity, burial/exposure status, residue depth, and the number of residue contacts for each amino acid. These structure-based terms are commonly derived from statistics of structural properties observed in representative structures (knowledge-based statistical potentials). Among various structure-based terms, residue-residue contact potentials[21–23] are unique in that they capture long-range interactions in a protein structure. A proper encoding of residue contact information is crucial for structure prediction because in principle, a full distance map or a residue contact map has sufficient information for reconstructing the tertiary structure of a protein. It has been also shown that a certain fraction of errors or missing contacts are tolerated for modeling the native structure of proteins[26–28]. When contact information is used as constraints in an “ab initio” structure prediction method, even very sparse information of residue contacts, for example, a contact for every eight residues in a protein sequence is sufficient to reconstruct the native structure. Correct identification of residue contacts is also important for template-based structure prediction since contact maps are usually well conserved between proteins of the same fold even at a very low sequence identity. There are two strategies of using residue contact information for structure prediction. One is to predict residue contact from a protein sequence[31–37] and use them as constraints or as an additional scoring term in a structure prediction procedure. The other approach is to employ a knowledge-based statistical residue contact potential to take into account general propensity of residue interactions. Various types of contact potentials have been proposed and applied for protein structure prediction[21–23, 39, 40]. They share the same principle but vary in details of their designs. For example, they differ in the definition of residue contacts, the reference state, whether or not to consider dependency to the distance and orientation. There are also contact potentials that consider more than two residues that are in contact[41, 42]. Here, we examined various definitions of residue contacts to identify the most effective definitions in the context of fold recognition. 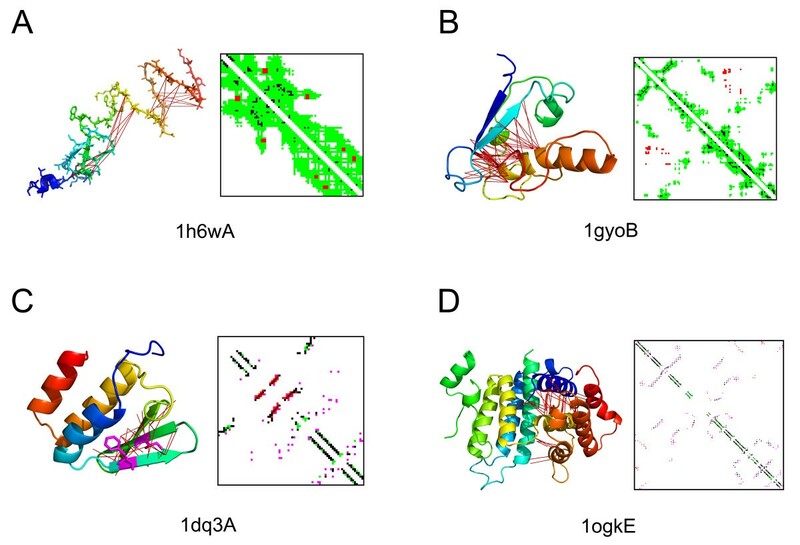 In contrast to the previous works that evaluated contact maps in terms of the accuracy of protein structure reconstruction[26–28], we examine definitions of residue contacts that can effectively distinguish proteins of the same fold from those of the other folds. Thus, information contained in residue contacts that are specific to each protein fold is evaluated in purely a practical scenario of the fold recognition. Concretely, we prepared 45 different contact definitions that consist of combinations of three different contacting atoms, i.e. Cα, Cβ, and heavy atoms with 15 distance cutoffs. Using the 45 different contact definitions, we examined how well contact maps defined by each definition can distinguish proteins of the same fold from others. The similarity of contact maps of two proteins is defined as the fraction of the common contacts between the two proteins, where equivalent residues are identified either by structural superimposition or a threading method. The purpose of using threading methods is to simulate the actual situation of threading where an alignment between a query sequence and a template structure is not always accurate. We found that 7.5/7.0 Å, 7.0/6.5 Å, and 4.5/5.0 Å perform best for the distance cutoff of contact definition using Cα, Cβ, and heavy atoms, respectively, for identifying protein pairs of the same fold. These cutoffs worked consistently well when threading-based alignments were used for identifying equivalent residues in protein pairs. On average, contact maps effectively distinguish proteins of the same fold from others when contacting residue pairs occupy 4.1 – 6.9% of the whole contact maps. We also found that effective contact definitions differ from fold to fold, suggesting that using different residue contact definition specific for each template will lead to improvement of threading performance. In Figure1 we show structural retrieval performance by considering the fraction of common contacts (FCC) of protein pairs, which is computed using 45 different residue contact definitions. For a protein fold, protein pairs within the same fold and across different folds were ranked according to their FCC values, with which ROC curves were plotted. 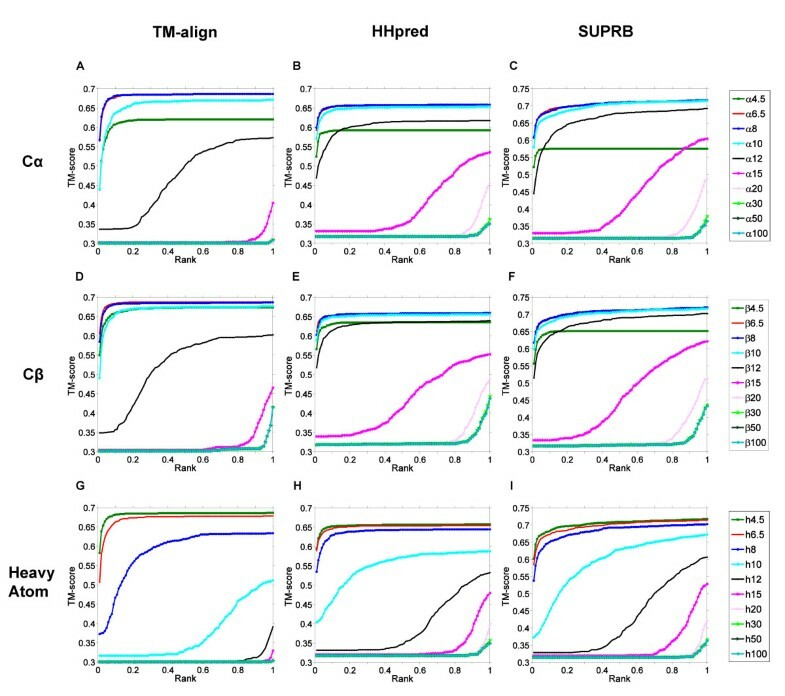 To identify equivalent residues between proteins, we used TM-align, a structural superimposition program (Figures1A,1D,1G), as well as two threading methods, HHpred (Figures1B,1E,1H) and SUPRB (Figures1C,1F,1I). The 45 different contact definitions consist of 15 distance cutoffs (4.5, 5.0, 5.5, 6.0, 6.5, 7.0, 7.5, 8.0, 10.0, 12.0, 15.0, 20.0, 30.0, 50.0, and 100.0 Å) for distances between Cα-Cα, Cβ–Cβ, and heavy atoms of residue pairs. When equivalent residues between structure pairs were correctly identified by structural alignments (TM-align) and thus FCC was accurately computed, distant cutoffs of 7.5 Å, 7.0 Å, and 4.5 Å showed best discrimination between within- and across-fold pairs for the Cα-Cα (Figure1A), the Cβ-Cβ (Figure1D), and the heavy atom (Figure1G) distances, respectively. Area Under Curve (AUC) for them were 0.908, 0.909, and 0.905, respectively. The other similar cutoffs showed slightly worse but comparable AUC: for the Cα-Cα distance, both 6.5 and 7.0 Å obtained AUC of 0.907. For the Cβ-Cβ, 6.5 and 7.5 Å showed 0.907 and 0.904 AUC, respectively. For the heavy atom distance, 5.0 Å showed 0.903 AUC. Proteins in the same fold become less distinguishable when smaller or larger distance cutoffs were used for residue contact patterns. For the Cα-Cα or the Cβ-Cβ distances, AUC of ROC curves quickly decreased when the 12 Å or larger cutoff was used, reaching to the random retrieval at 20 Å or higher. Using a smaller cutoff, 4.5 Å, also deteriorated the retrieval since contact maps became too sparse (on average only 1.61% or 0.33% of residue pairs in a protein were defined as in contact for the Cα-Cα and the Cβ-Cβ distances, respectively). Using the heavy atom distance, the 4.5 Å cutoff had the highest AUC value. 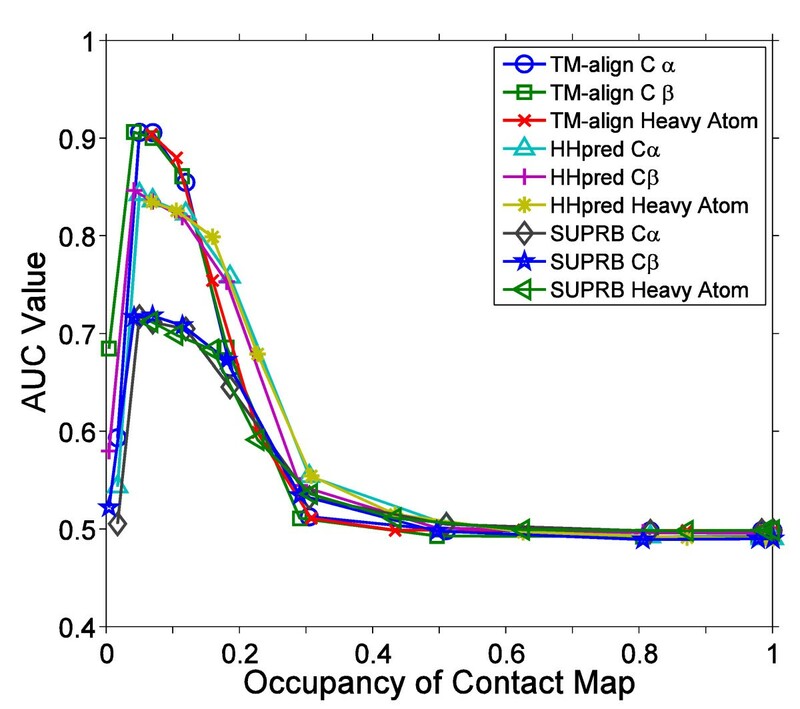 The average occupancy of contact maps with the heavy atom distance of 4.5 Å is 6.71%. This value is comparable to those of the best contact cutoffs for the Cα-Cα distance 8 Å and for the Cβ-Cβ distance 6.5 Å, which are 6.89% and 4.10%, respectively. Later we will investigate the relationship of the occupancy of contact maps and the AUC values more thoroughly. The AUC values by best performing definitions are summarized in Table1. In terms of the AUC, Cβ 7.0 Å achieved the highest value (0.909), although best performing cutoffs for Cα and Cβ showed similar values (~0.91) (Table1). The AUC value of the ROC curves of the best contact distance cutoffs for the Cα-Cα, the Cβ-Cβ, and the heavy atom distance. 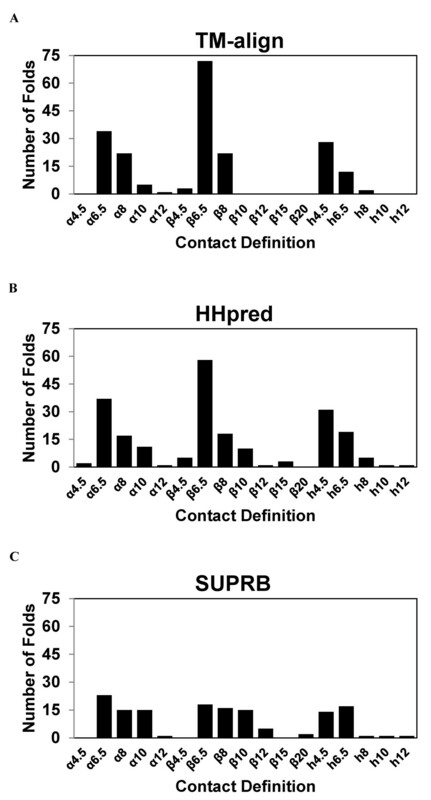 The middle and the right column in Figure1 show structure retrieval results obtained when the threading methods, HHpred (Figures1B,1E,1H) and SUPRB (Figures1C,1F,1I), were used to correspond residues of protein pairs to compare contact maps. The purpose of employing the threading methods is to introduce realistic errors in alignments of protein pairs, which are expected in actual threading process. Overall, lower AUC values were observed when threading methods were used relative to the cases when structural alignments were used (i.e. the left column in Figure1) for identifying equivalent residues. This deterioration of AUC values is due to the inaccuracy in the threading alignments. As shown in Figure2, the alignment accuracy (more precisely, the fraction of residues in a query protein that are correctly aligned to a template) and the FCC values correlate with each other for proteins of the same fold. The Pearson’s correlation coefficients for HHpred (Figure2A) and SUPRB (Figure2B) are 0.686 and 0.478, respectively. Thus, the more accurate the alignment is for a protein pair in the same fold, the higher FCC is obtained, which will be better distinguished from the background distribution of FCC of proteins of different folds. ROC curves for HHpred (the middle column in Figure1) showed higher AUCs than those of SUPRB (right column). This is also explained by the higher alignment accuracy by HHpred than SUPRB. As shown in Figure3, in most of the cases, alignments by HHpred are more accurate than those by SUPRB. The average accuracy of alignments of proteins in the same fold by HHpred and SUPRB is 20.38% (36.60%) and 7.93% (20.27%), respectively. In the parentheses, accuracy was shown when residues aligned within two residues from the correct position are counted as accurate. For 58.12% of the alignments, HHpred results were more accurate than SUPRB. When the accuracy calculation is relaxed to ±2 residues, 70.03% of the alignments by HHpred results were more accurate. Turning our attention back to Figure1, the best performing distance cutoffs for HHpred (the middle column) and SUPRB (the right column) are consistent with those found for the structural alignments. In all the cases, 6.5/7.0/7.5/8.0 Å, 6.0/6.5/7.0Å, 4.5/5.0Å showed the largest AUC for the Cα-Cα, the Cβ-Cβ, and the heavy atom distances. A qualitative difference of the ROC curves for HHpred/SUPRB is that larger distance cutoffs performed well at a similar level as the best performing distance cutoff compared with the ROC curves for TM-align (structural alignments). For example, the 12 Å cutoff for the Cα-Cα and the Cβ-Cβ distance performed similarly to the 6.5 Å cutoff in the case of HHpred/SUPRB, which was not observed for TM-align. Also, the heavy atom distance 4.5 Å performed clearly better than 6.5 Å in TM-align alignments, but quite similarly in the two threading methods. This is because residue contacts identified under a strict definition tend to be easily missed when incorrect alignments by threading methods are used. On the other hand, contact patterns defined with a larger distance cutoff are more tolerant to residue shifts in threading alignments. The same analysis of structure recognition was performed on the superfamily dataset, which gave consistent results (Additional file1). Since they gave quite similar results, below we will only discuss the results obtained for the fold level dataset. Apparently, contact maps lose fold-specific information if residue contacts are defined with a too short or a too long distance cutoff because maps become too sparse or dense with contacts. To examine how the occupancy of contact map affects the fold retrieval accuracy, we plotted the average AUC values relative to the occupancy of contact maps computed using different distance cutoffs for three different contact bases and the three alignment methods (Figure4). The occupancy (the x-axis) of a contact map is defined as the fraction of residue pairs in contact among all the pairs of residues in the map. For each combination of a contact base and an alignment method, the highest AUC was observed when the occupancy is at 4.10% to 6.89%. The average AUC slowly drops as the fraction of residue contacts further increases and reaches to random retrieval level when 30-40% of residue pairs are defined as in contact. We have also evaluated the retrieval performance in terms of the structural similarity of the top ranked protein pairs. In Figure5, the best TM-score of protein pairs up to certain ranks are plotted using the contact maps of a subset of residue contact definitions as Figure1 (4.5, 6.5, 8.0, 10.0 12.0, 15.0, 20.0, 30.0, 50.0, 100.0 Å for the Cα-Cα, the Cβ-Cβ, and the heavy atom distance). The relative performance of each distance cutoff is essentially consistent with the ROC curves in Figure1. Using 6.5 Å and 8 Å for the Cα-Cα and the Cβ-Cβ distance and 4.5 Å for the heavy atom distance retrieved structurally similar protein pairs at higher ranks than the other distant cutoffs. Using distance cutoffs of 15 Å, 15 Å, 12 Å or larger for the Cα-Cα, the Cβ-Cβ, and the heavy atom distance did not yield protein pairs with significant structural similarity (TM-score > 0.5) within the earlier half of the ranks in the retrieval. In Figure6, fold recognition was performed using residue contacts with different sequence separation ranges, contacting residue pairs that are separated by 5–10 residues on the sequence, 11–23, and over 23 residues apart. The contact definition of Cβ-Cβ, 6.5 Å was used, since it was one of the best performing definitions for the three alignment methods. Interestingly, the largest AUC value was achieved by using >23 contacts, consistently for TM-Align, HHpred, and SUPRB alignments. AUC values for 5–10, 11–23, and >23 were 0.707, 0.754, and 0.875. This result indicates that long-range contacts are more informative for distinguishing folds. We further examined fold recognition with a relaxed definition of common contacts. A pair of residue contacts in two proteins are considered as common when they occur within ±1 residues to each other in a given structural alignment. Although the results do not differ much from those by the original definition of common contacts, “blurring” contacts made fold recognition slightly worse for all three types of alignments. For TM-align alignments, AUC decreased from 0.907 to 0.888, from 0.847 to 0.837 for the HHpred alignments and from 0.717 to 0.699 for the SUPRB alignments. The AUC values are for the contact definition of Cβ-Cβ 6.5 Å. Next, we examine the structure retrieval performance using FCC on four major fold classes separately, all-α class, all-β class, α/β class, and α + β class in the fold dataset (Figure7). There are 41, 41, 45, and 55 folds in each class, respectively. We used the contact definition of 6.5Å for the Cβ-Cβ distance, since it is one of the best performing definitions in the previous experiments in Figures1 and5. Figure7 shows that the structure retrieval performance varies for different fold class. When TM-align was used (Figure7A), folds in the α/β, and the β class are better distinguished than those in the α+β and the α class. However, trend is different for retrieval using FCC computed with the two threading methods, HHpred (Figure7B) and SUPRB (Figure7C). Among the four classes, the all-β class performed worst. Since we found that the retrieval results for the threading methods are largely affected by their alignment accuracy (Figures1,2,3), in Figure8 we examined the alignment accuracy by HHpred (Figure8A) and SUPRB (Figure8B) for the four fold classes. It is found that, consistent to the retrieval results in Figure7, all-β proteins show the lowest alignment accuracy by both HHpred and SUPRB. Moreover, the overall order of the accuracies for the four fold classes is consistent with the structure retrieval performance shown in Figure7. Thus, it is confirmed that the retrieval accuracy of fold classes reflects the alignment accuracy of proteins in each classes. Figure9 shows four examples of poorly recognized folds using FCC computed with the threading methods. The Cβ-Cβ distance 6.5 Å was used for the contact threshold. The first three pairs (Figures9A, B, C) are from the all-β class while the last one is from the α/β class. Proteins in the first example (Figure9A) have the immunoglobulin-like β-sandwich fold, which have two layers of β-sheets. The query (2h7wB) contains eight β strands and the template (1ifrA) has nine. TM-align aligned the two-layer structure correctly yielding an alignment with an RMSD of 4.21 Å for 72 residues, which corresponds to 67.3% and 63.7% of the length of 2h7wB and 1ifrA, respectively. The RMSD was computed by the LGA program. 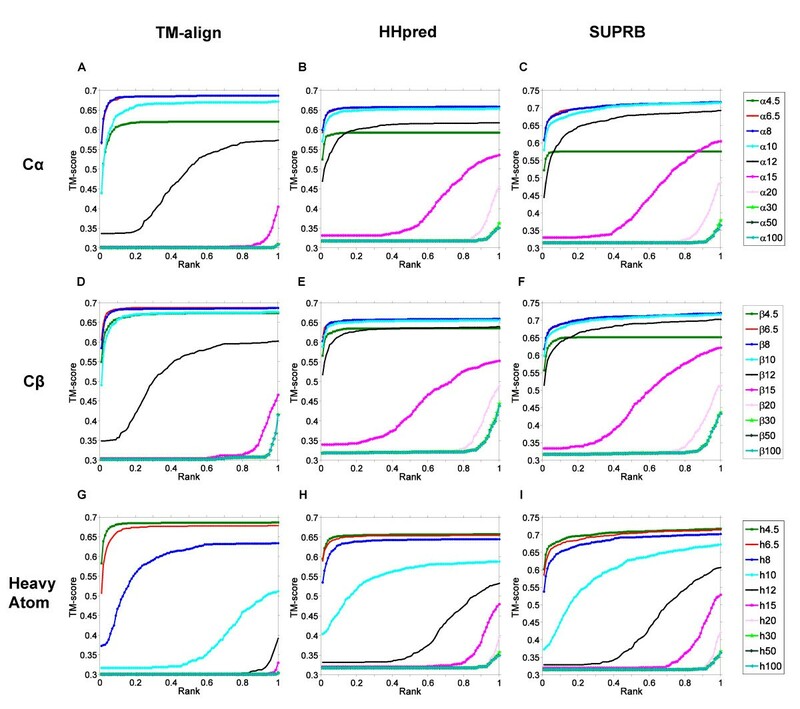 On the other hand, the two threading methods shifted alignment at the N-terminal region (Figure9A illustrates misalignments of HHpred and SUPRB), which resulted in RMSDs of 13.54 Å and 15.96 Å by HHpred and SUPRB, respectively. The FCC values by TM-align, HHpred, and SUPRB are 45. 8%, 2.2%, and 0.0%, respectively. The second example (Figure9B) is proteins of the glycosyl hydrolase-fold. TM-align produced an alignment with a 3.15 Å RMSD and FCC of 50.0%, while the RMSDs of HHpred and SUPRB alignments are 12.16 Å and 12.29 Å with FCC of 38.8% and 13.8%, respectively. The third example (Figure9C) is a protein pair of the “Common fold of diphtheria toxin/transcription factors/cytochrome f” fold, which have nine β strands forming two layers. TM-align captured the overall folds correctly with an RMSD of 3.10 Å and a FCC of 74.1%. On the other hand, HHpred and SUPRB misaligned the protein pair mainly at the first half of the proteins. This alignment error caused worse RMSDs of 5.79 Å and 16.74 Å and FCC values of 44.2%, and 9.9%, respectively. The last example is a protein pair in the α/β class (Figure9D), the preATP-grasp domain fold. The structures of the proteins have a similar α/β/α three layer core. TM-align aligned each layer from the two proteins yielding an RMSD of 2.81 Å and FCC of 62.5%. However, HHpred and SUPRB shifted the whole alignment, resulting in RMSDs of 11.89 Å and 13.24 Å, and FCCs of 34.3% and 2.7%, respectively. These examples illustrate that the threading methods’ frequent mistakes of shifting β strands in their alignments, leading to failure of detecting conserved contact pattern of the proteins. Up to this point, we examined the fold retrieval performance of the various contact definitions averaged over all folds in the dataset. In this section, we investigate best contact definitions for individual protein folds. Different folds hold different conserved contact patterns. Thus, residue contact definitions that achieve the best fold recognition for a certain fold may be different from the 7.0 Å Cβ-Cβ distance that works best on average. For each fold, we selected a definition with the largest AUC value in the fold retrieval among 30 different definitions. If more than one definition has the same AUC value, then all of them are counted. A fold was not counted if its largest AUC is less than 0.7. 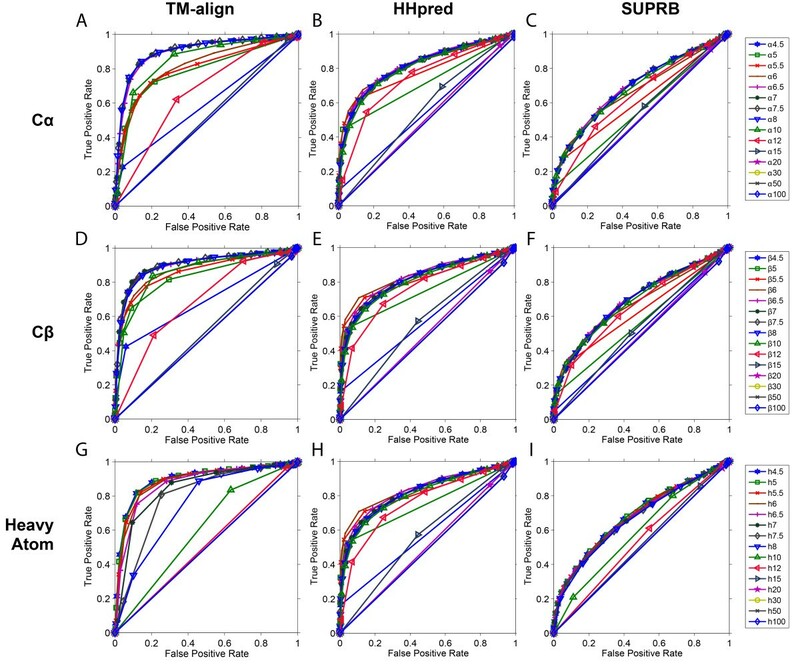 Figure10 shows the distributions of best performing contact definitions for folds for TM-align, HHpred, and SUPRB. When structure alignment by TM-align was used (Figure10A), 6.5 Å Cβ-Cβ distance worked best in 72 out of 201 cases (35.8%). 6.5 Å Cα-Cα distance came to the second (best for 34 folds) and 4.5 Å heavy atom distance was the third (best for 28 folds). When HHpred was used for alignments (Figure10B), larger distances that did not appear for TM-align (Figure10A), i.e. 10 Å, 12 Å, and 15 Å for the Cβ-Cβ distance, performed best for some folds. For SUPRB (Figure10C), the distribution of the contact definitions is very different from that of TM-align. Counts are more evenly distributed for different distance cutoffs. The largest counts were observed for the Cα-Cα distance 6.5 Å (23 cases; 16.0%), and the second and the third were the Cβ-Cβ distance 6.5 Å (18 cases) and the heavy atom distance 6.5 Å (17 cases). Why does the overall best definition not work well for some folds? Figure11 illustrates when structures are better recognized by a contact definition that is different from the Cβ-Cβ distance 6.5Å. The first example, 1h6wA, has a loosely packed C-terminal region (Figure11A). The best contact definition for this fold is the Cβ-Cβ distance of 20 Å when using TM-align. Such a large cutoff produces a contact map that contains all contacts from the definition of the Cβ-Cβ distance 6.5 Å and additionally captures neighboring residues in the C-terminus, as shown in the contact map. Although these “contacts” identified by the large distance cutoff are not physical interactions, characteristic structural information can be captured, which contributes for more accurate recognition of this fold. For the second example, 1gyoB, the best contact definition was found to be 12 Å for the Cα-Cα distance. As shown is Figure11B, this definition covers all the contacts identified with the definition of Cβ-Cβ distance 6.5 Å as well as important interaction between α helices and β strands (e.g. contacts in red). The latter two examples show the difference of fold recognition abilities by the Cα-Cα distance 6.5 Å and the Cβ-Cβ distance 6.5 Å. The Cα-Cα distance of 6.5 Å had the second largest count for TM-align (Figure10A) and HHpred (Figure10B) and the largest count for SUPRB (Figure10C). 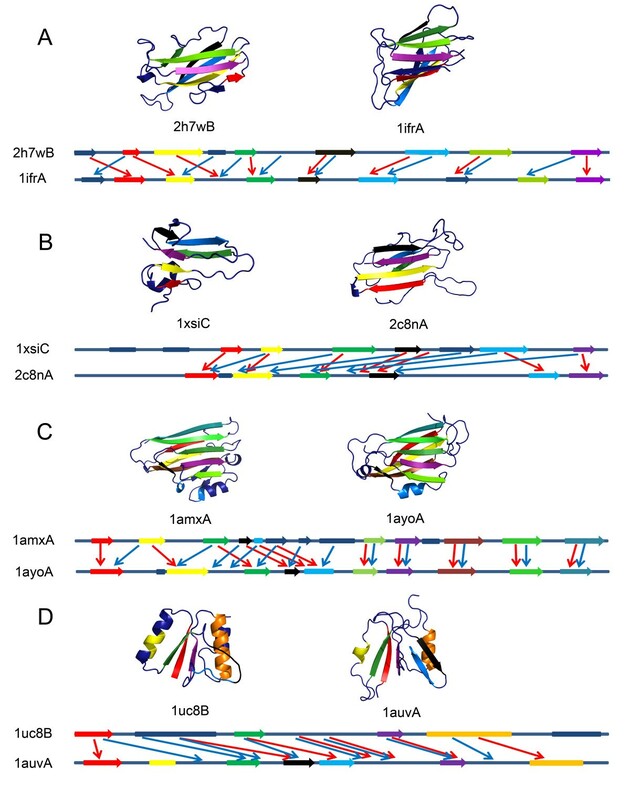 Figure11C shows a structure of intein-encoded homing endonuclease PI-PfuI, ldq3A. The AUC value using the Cα-Cα distance 6.5 Å for this fold was 0.848 while it was significantly worse, 0.601, with the Cβ-Cβ distance of 6.5 Å when TM-align was used for the structure alignment. Contacts shown in red in the map are for residue pairs between three β strands (shown by red lines in the structure), which are detected only by using the Cα-Cα distance 6.5 Å. As illustrated by contacting residue pairs shown in magenta in the structure figure, these contacts are not detected by the Cβ-Cβ distance 6.5 Å because the side-chains are placed in opposite directions. In contrast, the Cβ-Cβ distance 6.5 Å performed better for capturing residue contacts between α helices for 1ogkE (Figure11D). AUC using the Cβ-Cβ distance 6.5 Å and the Cα-Cα distance 6.5 Å for structural alignments were 0.97 and 0.92, respectively. Contacts colored in red in both the structure and the contact map are those which are captured uniquely by the Cβ-Cβ distance 6.5 Å but not Cα-Cα distance 6.5 Å because they are too far for the latter. In this work, we tested thirty different residue contact definitions in the context of fold recognition. To investigate the pure ability of contact patterns for distinguishing folds, we introduced the fraction of common contacts (FCC) of protein pairs and examined how well FCC computed with different definitions select proteins of the same fold from the rest of the protein pairs of different folds. To examine how much incorrect alignments in threading affect the fold recognition accuracy, we also used two threading methods, HHpred and SUPRB, to determine corresponding residues of proteins. We found that overall, the Cβ-Cβ distance 7.0 Å works best for identifying proteins of the same fold consistently for structural alignments and threading alignments. A qualitative difference between the threading alignments and structural alignments is that the former prefer larger distance cutoffs for defining contacts because they are more tolerant to misalignments (Figure10). In the case of threading, alignment accuracy strongly influences the fraction of common contacts identified among proteins of the same fold (Figure2), which eventually affects fold recognition accuracy (Figures1,5). It turned out that threading alignment accuracy is relatively poorer for all-β proteins (Figure8), and thus those proteins have lower fold recognition accuracy (Figure7). Finally, we found that the effective contact definition to identify folds depends on the folds (Figure10). A larger distance cutoff is advantageous for capturing spatial arrangement of the secondary structures of a fold, which are not physically in contact. For capturing contacts between neighboring β strands, considering Cα atoms is better than Cβ, because sometimes the side-chains point to opposite directions (Figure11C). The results of this work suggest two potential directions of implementing residue contacts for improving fold recognition. Since a larger distance cutoff is effective in capturing local topology of proteins, employing a “long-distance” interaction potential for residues that are 6.5 Å to 12 Å apart may improve recognition accuracy. The long-distance interaction potential may be used as a scoring term in threading together with a regular contact potential (e.g. for contacts defined within 4.5 Å between heavy atoms). Another idea is to use different fold-specific contact definitions (Figures10,11) for each structure in a template database. This study focused on seeking effective inter-residue contact definitions for template-based protein structure prediction. Residue contacts defined by Cβ−Cβ distance of 7.0 Å work best overall among tested to identify proteins of the same fold. We also found that effective contact definitions differ from fold to fold, suggesting that using different residue contact definition specific for each template will lead to improvement of the performance of threading. Two sets of domain structures of globular proteins were selected according to the SCOP database (release 1.73), one for representative protein folds and another one for representative superfamilies. We selected protein folds that have at least three superfamilies, from each of which one domain structure was selected. Entries were discarded if their PDB files contain only Cα traces. In total, 194 folds were selected. The numbers of structures in each fold range from 3 to 110. In total, there are 2167 structures in the fold dataset. Similarly, a dataset of 250 representative superfamilies that contains a total of 1672 structures were selected. Each superfamily in the dataset contains at least three families, from each of which one structure was selected. In the following part, we will explain the experiment procedure on the fold dataset and readers should be aware that the same procedure was performed on the superfamily dataset. For each structure in the datasets, we constructed contact maps using thirty different contact definitions: three contact bases to consider for an amino acid residue, i.e. Cα, Cβ (Cα atom is used for glycine), and heavy atoms from two residues, with 15 distance cutoffs for each (4.5, 5.0, 5.5, 6.0, 6.5, 7.0, 7.5, 8.0, 10.0, 12.0, 15.0, 20.0, 30.0, 50.0, and 100.0 Å). To eliminate obvious contacts from neighboring residues, we only considered contacts between amino acid residues that are at least three residues apart in the primary sequence. The aim of this work is to examine how well residue contacts determined by each of thirty definitions can distinguish proteins of the same fold from the others. To identify common contacts between two protein structures (more precisely, contact maps of the two protein structures), we need an alignment of the two proteins to identify structurally equivalent residues between them. Alignments were obtained using three methods, TM-align, HHpred, and SUPRB. TM-align is a structure alignment method, which aligns two tertiary structures using a dynamic programming algorithm and computes the root mean square deviation (RMSD). We consider structural alignments calculated by TM-align as the golden standard of the alignments. The latter two methods, HHpred and SUPRB, are threading methods. For a pair of proteins, the sequence of one of them is threaded (aligned) on the other protein structure. The purpose of using the threading methods is to introduce realistic errors that can happen in the alignment process of threading. HHpred uses a hidden Markov model that characterizes proteins with sequence profiles and predicted secondary structures. SUPRB is a threading method that uses a composite scoring function with sequence profile, solvent accessibility, secondary structure matching, main chain angle preference, and a residue contact potential term. In this experiment we deleted the contact potential term from the scoring function. Given contact maps of two proteins and an alignment (either by TM-align, HHPred, or SUPRB), the fraction of common contacts (FCC) was computed as follows: Suppose residues a i and a j in protein A (the query) are aligned with residues b m and b n in another protein B (the template), respectively. If the (a i , a j ) pair and the (b m , b n ) pair are in contact within each protein respectively, then we count them as a common contact between the two proteins. Finally, the FCC for the query protein is computed as the number of residues in the query that are involved in at least one common contact relative to the number of aligned residues. FCC ranges from 0 to 1. For a group of proteins of the same fold, FCC was computed for each pair of them. As a reference, we took one protein from each fold (thus 194 proteins in total) and computed FCC between the selected protein of the fold and the other proteins from different folds. The difference between FCC values of proteins within the same fold and those across different folds reflects the ability of fold recognition by a certain definition of residue contacts. For a fold group, we sorted protein pairs of the same fold and those from different folds by their FCC and computed the receiver operator characteristic (ROC) curve. For each contact definition, an average ROC curve was computed by averaging the true positive values of all the folds at the same false positive rate. The authors thank Lillian Liu for proofreading the manuscript. This work has been supported by grants from the National Institutes of Health (R01GM075004, R01GM097528), National Science Foundation (EF0850009, IIS0915801, DMS0800568), and National Research Foundation of Korea Grant funded by the Korean Government (NRF-2011-220-C00004). CY participated in design, helped implementation of programs for the study, performed the analysis, and drafted the paper. HC coded some of the programs used and prepared the dataset. DK conceived of the study, participated in its design, and finalized the manuscript. All authors read and approved the final manuscript.